I don’t know any red-blooded American who doesn’t enjoy Independence Day. Fireworks –- Family -- Food -– Fun –- what’s not to like? However, many people have forgotten that this is more than just a day off from work. So, why do we celebrate Independence Day every July 4th? Independence Day (July 4th) is the day set aside every year as a Federal holiday in the United States of America to commemorate the day the Declaration of Independence was signed by some (but not all) of the members of the Continental Congress declaring the 13 British colonies to be an independent nation, free from the rule of England. Taxation without representation was the major issue. The 13 American colonies were forced to pay ever increasing taxes to England’s King George III without any representation in England’s parliamentary government. There were many other items of contention such as unlawful searches, unlawful seizure of property as well as individuals being forced to house and feed British troops without any reimbursement. 1774 The First Continental Congress was formed. The 13 colonies sent delegates to Philadelphia, Pennsylvania to discuss the situation. They were unhappy, but were not prepared to declare their independence or start a war. April 1775 King George’s troops advanced on Concord, Massachusetts. They were given secret orders to capture and destroy military supplies that were reportedly stored by the Massachusetts Militia. This information was discovered by the colonists, prompting Paul Revere’s midnight ride that sounded the alarm “The British are coming, the British are coming.” The subsequent battle at Lexington and Concord are famous as the “shot heard round the world,” and marks the unofficial beginning of the American Revolution. May 1776 The colonies tried to work out their differences with England for nearly a year but eventually sent delegates to the Second Continental Congress. June 1776 The Second Continental Congress agreed that their efforts to peacefully resolve there differences were pointless and chose a committee headed by Thomas Jefferson to compose the Declaration of Independence. Other members of the committee were John Adams, Benjamin Franklin, Philip Livingston and Roger Sherman. June 28, 1776 Thomas Jefferson presents the first draft of the Declaration of Independence to Congress. July 5, 1776 The Pennsylvania Evening Post is the first newspaper to print the Declaration of Independence. August 1776 The task to gain signatures on the Declaration of Independence, which began on July 4th was not completed until August. However, July 4th has been accepted as the official anniversary of United States independence from England. 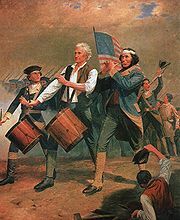 July 4, 1777 The first Independence Day celebration takes place. Thirteen gunshots were fired, once at morning and again at evening in Bristol, Rhode Island. 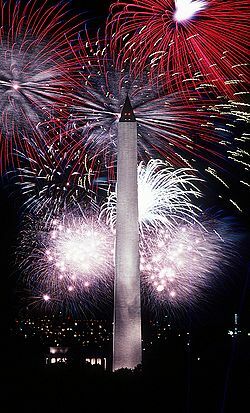 Philadelphia celebrated the first anniversary in a manner modern Americans would find familiar, -- an official dinner for the Continental Congress, toasts, 13-gun salutes, speeches, prayers, music, parades, troop reviews, ships decked with red/white/blue buntings and, of course – fireworks! By the early 1800’s the typical traditions of fireworks displays, parades and picnics were firmly established as part of American culture. October 19, 1781 The decisive military campaign of the American Revolution culminated with the British surrender to combined American and French forces under the command of George Washington. The Siege of Yorktown effectively ended the six-year struggle of the Revolutionary War and set the stage for a new government and nation. I hope you enjoyed this Independence Day history lesson. Never forget the price others paid for the freedoms you enjoy each and every day in this country. Keep the flame of freedom alive. Forward this Independence Day History to others.